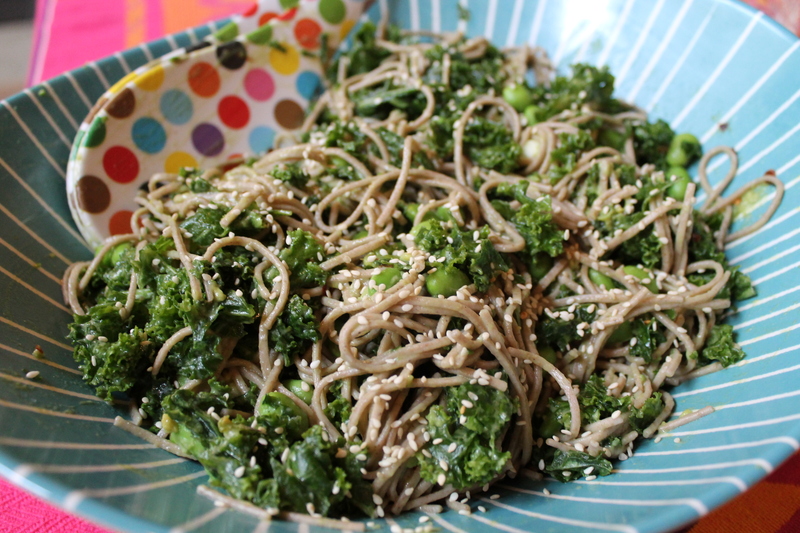 Kale Soba Noodle Salad – Voila! When I told James I was joining a Mahjong group he asked, “What are you, the Future Old Jewish Grandmothers of America?” We like to start early. We meet once a month and each person who hosts the game also provides the food. As a group of Jewish women, we take the food part seriously. Who wants to go over to someones house and have cheese and crackers for dinner? Don’t get me wrong, I love cheese. Yo amo queso. But when it comes to dinner, I like to feel like I had a complete meal. As host for July, I made a kale soba noodle salad along with vegetarian egg rolls and potstickers. For those of you new to soba noodles, they are gluten-free buckwheat noodles originating in Japan. They can be used in salads (obviously), as well as hot soups or other dishes. My open secret is that I got the egg rolls and potstickers from the frozen food aisle. The soba noodle salad was super easy and particularly refreshing in the summer. It seems endlessly versatile with the type of ingredients or dressings you could add to it. Wash and dry kale well. Sprinkle the kale with sea salt and 1 tablespoon of peanut oil. Use your hands to massage the oil and salt into the kale until softened, a minute or so. Tear the leaves by hand or stack the leaves on top of each other, and use a sharp knife to cut into 1/4 inch strips. Meanwhile, bring a salted pot of water to boil. Add the soba noodles and cook according to package instructions, adding the frozen edamame for the last five minutes. Drain and immediately rinse with cold water to stop the cooking process. Combine avocado, garlic, remaining tablespoon of peanut oil, ginger, red pepper flakes, soy sauce and lime juice using a blender or handheld blender. Puree until smooth. Add spices to taste.